Our professionalism and attention to detail allow us to exceed your expectations. We bring excellent communication and understanding of your deadlines. We work well with other contractors, appreciating each others' time schedule and job space. In Mid-Central Framing, you'll find a reliable partner and resource. Call us today at 320-267-0104, and we'll get started on an estimate! Framing contractor Duane Ludwig, the owner of Mid-Central Framing, LLC, has been managing framing projects and building homes in the St.Cloud and metro area for over 25 years. He has worked very hard to build a company that can offer the workmanship that it takes to make jobs go smoothly. Duane takes personal pride in each and every job that he and his team complete. We bring experience and expertise to every project, every day. 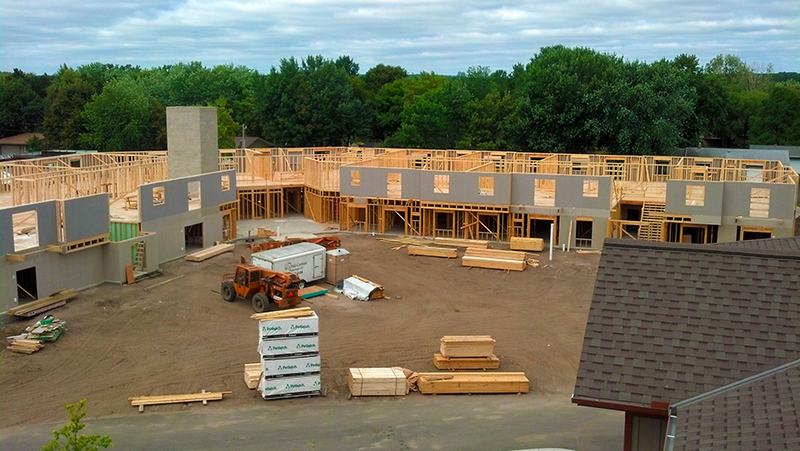 We are ready to estimate your framing project in Minnesota for apartment buildings, assisted living facilities, senior housing, hotels, churches and more! We understand the importance of meeting your deadlines, so we are prepared and able to work closely with other contractors, respecting timelines and space needed on the job. We have been in business since 2003 serving the St Cloud and Twin Cities and surrounding areas. Our clear communication and respect for your needs will allow us to work well together. Big or small, we’ve got a solution when you need it. We are ready to answer your questions and work with you to estimate your project! More information? We are ready for your questions: 320-267-0104.